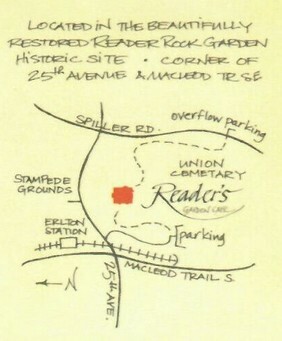 The Reader Garden Cafe is somewhat discreet tucked away behind the trees and shrubbery that shield it from the traffic on nearby Macleod Trail and 25 Avenue S.E. It isn't the most prominent of spaces but truly a hidden gem. Only hints of what lies beyond the large conifers are found at the base flower bed near close to the parking lot and near the welcome sign … Reader Rock Garden. Follow the pathway upwards and stroll along carpets of naturalized bulbs, mature trees and shrubs to the historic building. Handicapped drop-off and parking (2 stalls) are available at the Cafe with access from Spiller Road.